Green Ideas: Can you tell what it is yet? I've been trying to figure this interesting sign out. 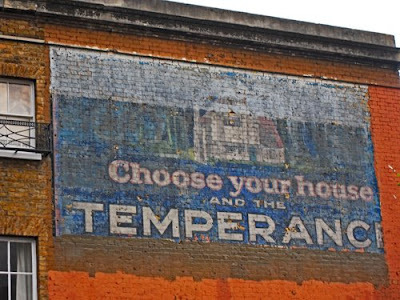 My Guess - Temperance being likely related to alcohol reduction - and the Temperance movement. The street location is Sheen Rd,and Alton in Richmond, Surrey, UK - the sign or hoarding was removed after the Google Street mapping was done. I did find out that The Wallpaper History Society exists - due to a link from a business on Sheen Road. Tell us the full story! Hi Terry, welcome to greenideas. Be great to know! I'm snapping "old adverts painted on the sides of buildings" on my iphone as I go around town, and this was on my list!